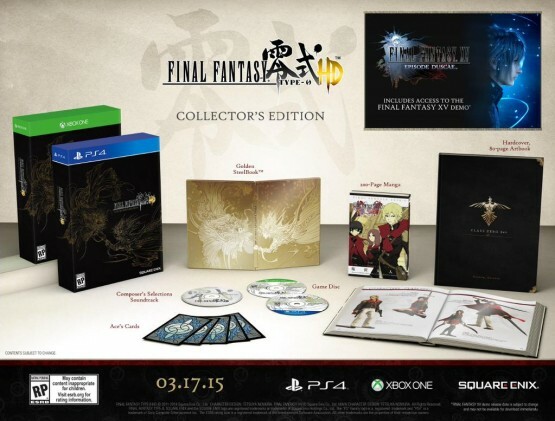 Priced at $99.99/£79.99/€99.99, Square Enix has revealed the Collector’s Edition for Final Fantasy Type-0 HD on PlayStation 4 and Xbox One, which is available through the Square Enix Store (North America, Europe). Golden Steelbook – Showcasing the unique and beautiful artwork of famed illustrator Yoshitaka Amano, it will include a copy of the game. 200-Page Final Fantasy Type-0 Manga – Available for the first time outside of Japan, this explores the origins of Class Zero. Composer’s Selection Soundtrack CD – Featuring 15 tracks specifically chosen by the original soundtrack composer, Takeharu Ishimoto. Cards – Five life-size replicas of the iconic playing cards used by Class Zero’s Ace. Final Fantasy XV: Episode Duscae Demo – An exclusive demo for Final Fantasy XV. Steelbook Limited Edition – Features a reversible box design and transparent cutaway sleeve. FR4ME Limited Edition – Boasts a case design that can be displayed like a picture frame and lets owners customise the appearance using the art cards that are included. Final Fantasy Type-0 HD launches on March 17, 2015 in North America and March 20, 2015 in Europe.